Home Crime Brother, Can you Spare a Dime? KENNARD – A coin changer theft led to the arrest of a man on a Class A misdemeanor charge which in turn, led to his arrest on a failure to appear warrant for drug possession. 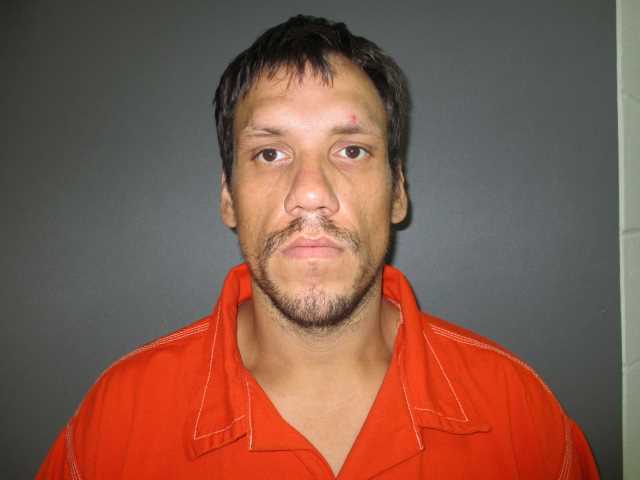 Christopher DeWayne Mead, 32, from Pennington was taken into custody and charged with theft from the elderly and the failure to appear warrant after he was seen on video surveillance committing the offense. According to an affidavit of probable cause, Houston County Sheriff’s Office Deputy William Garner was dispatched to 409 Welch St. in Kennard on Aug. 6 in reference to the theft of a coin operated machine. The machine involved is a bill changer from a laundry mat in an apartment complex located at the Welch Street address. When the deputy arrived on the scene, he met with a resident of the apartments who provided security footage of the theft. “Deputy Gardner learned from witnesses that the coin operated machine had been inside the laundry mat prior to Christopher Mead and Kimberly Freeman’s arrival and was discovered missing after their arrival,” the affidavit reported. The video showed the arrival of Mead and Kimberly Cheryl Freeman at the laundry mat at approximately at approximately 6:30 p.m. on Sunday, Aug. 5. “In the video, Christopher Mead can be observed moving the vending machine – that the bill-to-coin change machine was attached to – away from the wall while Kimberly Freeman stands at the door looking around,” the affidavit stated. The video also showed Mead turning off the lights in the business while he removed the bill-to-coin changer, placed it in a laundry basket and covered it with clothes, the affidavit indicated. “Both subjects can then be seen rushing out of the laundry mat with Christopher Mead carrying and placing the laundry basket, containing the coin-operated machine, in the backseat of Kimberly Freeman’s Tahoe before driving off,” the probable cause document stated. The deputy was able to identify the subjects through witness descriptions and their previous dealings with law enforcement. Gardner located Mead and Freeman at an address in Pennington and while both admitted to being at the laundry mat, both denied any knowledge of the stolen bill-to-coin changer. A warrant for Mead’s arrest was issued and he was detained on Friday, Aug. 17. The status of Freeman is unknown at this time. Mead was charged with theft from the elderly because of the age of the laundry mat’s owner, a Class A misdemeanor. He was also detained on a failure to appear warrant for possession of controlled substance, penalty group one, a second degree felony. Mead has been no-bonded on the failure to appear charge.